Bumpy is best known for directing a season of the extremely popular youth-based adventure show 'Roadies'. The behind-the-scenes footage made him a recognisable face with those who followed the show. As a film director, he made 'Luv Ka The End', the first feature film to have been produced by Y-Films, Yash Raj Films' youth film banner. He was also supposed to direct 'Virus Diwan', a film which was to launch Arjun Kapoor but was shelved. 'Bank Chor', featuring Riteish Deshmukh in the titular role and co-starring Vivek Anand Oberoi and Rhea Chakraborty, was supposed to hit the screens way back in 2015 but for reasons best known to the makers is releasing now. Despite being a delayed product, one looks forward to the film as the innovative marketing campaign has made a mark and the promos do not give out the fact that the film has been in the cans for more than two years. Champak Chiplunkar (Riteish Deshmukh), dressed as a bearded sage, arrives in a bank and engages in a conversation with the staff members. Gulab (Bhuvan Arora) and Genda (Vikram Thapa) come to the bank wearing animal shaped masks. The three of them soon disclose their intention of robbing the bank. Being inexperienced at this job, they commit several mistakes, one of which results in the police and the CBI arriving to nab them. CBI officer Amjab Khan, for some reason, takes a keen interest in the case. He meets the three wannabe robbers and gives them an hour to surrender themselves to the cops. The first thirty minutes of the film are dull and boring. The screenplay comes across as flimsy and the jokes do not work. Thankfully, the plot gets interesting after a while and the film throws up several twists and turns that keep you engaged. The promos gave the inkling of the film being an out-and-out comic caper. However, as the story moves forward, you realize it intends to serve up thrills in generous doses. Towards the end of the first half, you are surprised to see the narrative has shock value and intense drama. The drama intensifies and the thriller quotient goes up by several notches in the second half and the climax ends the film on a high note. One of the reasons a good part of the first half fails to register an impact is because of the script which is filled with glaring loopholes that are hard to ignore. Amjad Khan gets inside the bank and talks to the Champak and his accomplices. One would expect a tough cop like him to nab the three of them right there easily but he does not do that even as he knows that all the people, whom they have held hostage, are not under their watch at the moment. One fails to understand why he does not arrest them when he has all the means and the opportunity to do so. Many scenes which aim to evoke laughter fail to do so. At least a few of them should have done away with at the editing table itself. 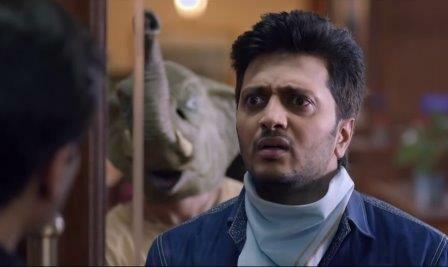 Riteish Deshmukh is in terrific form here. His comic timing is impeccable and the actor exudes a good amount of style and charm in the latter part of the second half. Vivek Anand Oberoi looks every bit the tough cop he is portraying himself to be in the film. He gets several scenes to shine as a heroic character. Rhea Chakraborty looks stunning and leaves a mark as 'GaGa' even though her career has a limited graph. Sahil Vaid, who shone as Varun Dhawan's friend in 'Humpty Sharma Ki Dulhania' and 'Badrinath Ki Dulhania' delivers an outstanding performance. His character is a far cry from the comical roles he had played in the aforementioned films. He is surely a talent to watch out for. Bhuvan Arora and Vikram Thapa have substantial roles as Champak's accomplices and both of them deliver good performances. The initial reels of Bank Chor fail to excite you as a viewer. However, after a bumpy (no pun intended) start, the film redeems itself in quite a big way. The humour could have been far more amusing but the twists and turns keep you hooked to the film right till the last frame. While you wait for the big release 'Tubelight' to hit screens the next week, you can get yourself a fair dose of entertainment with 'Bank Chor' this weekend.